My Spazzatura breakfast comes in two forms: a low carb version and a super hearty, very-much-not-low-carb version. The former typically consists of sauteed peppers and onions, turkey smoked sausage, CHEESE!! and eggs (I liked scrambled, he likes over medium). The latter is all the above with the heavenly addition of crispy roasted red potatoes. Why two versions? Put simply, we used to pretend we follow a low-carb diet, but in reality, my husband hates most low-carb food. See, he thought low-carb meant steak and bacon and cheese exclusively. For every meal. Meat and cheese and more meat. What he got was cauliflower mac (which is DELICIOUS, btw) and stuffed eggplant (also delicious, but definitely not steak and bacon). And after about a month of flax bread and cauliflower rice, he had enough. So, two versions. Today I went for total glory and carbed it up, and am so happy I did. 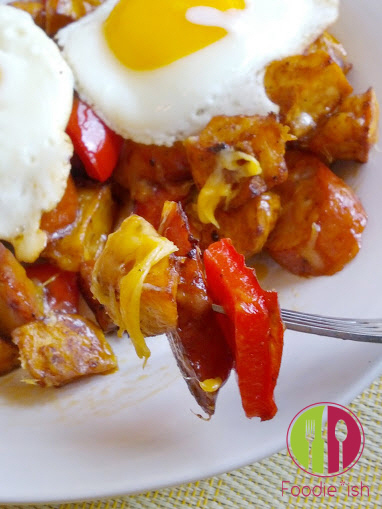 Crispy roasted potatoes with a hint of garlic and paprika… I could eat that alone. 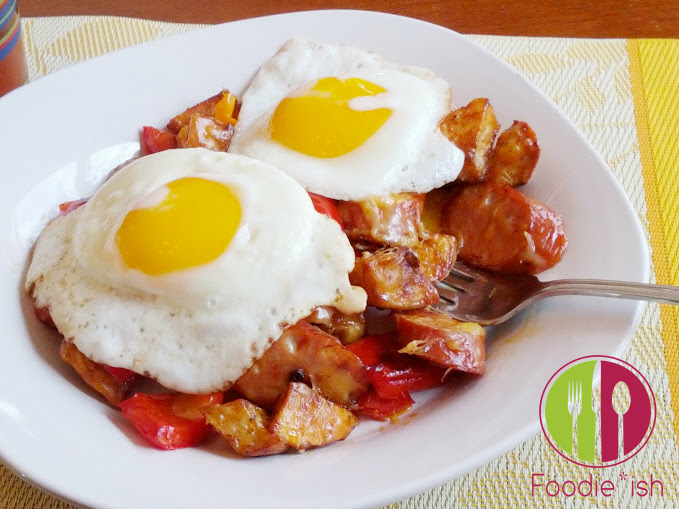 But coupled with sauteed red and orange peppers, a little red onion, loads of melty cheddar jack, AND chipotle chicken sausage… Oh my lanta! Gimme a fork! No seriously. Like, right now. Because this is Foodie*ish, substitute what you’ve got on hand. 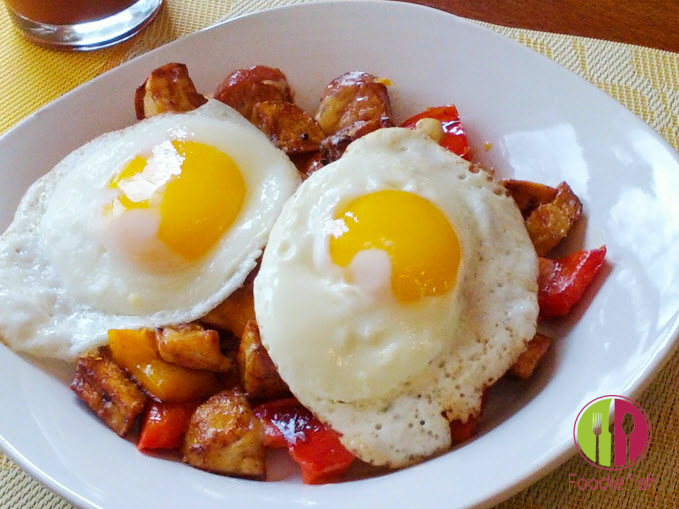 Although my go-to protein for “Garbage Eggs” is turkey smoked sausage, today I subbed in a package of Chipotle & Jack Chicken Sausage. I wanted to give it a try, and thought this was the perfect opportunity. It did not disappoint. However, be forewarned… it was on the spicy side. I like a little kick, and I usually douse my Spazzatura in hot sauce, but the kick from this sausage was pretty adequate on it’s own. Not like, ‘holy buckets I need some milk and maybe I will need to ice my tongue’ kind of kick, but you definitely notice the heat. If that’s not your thing, stick to smoked sausage or even cubed ham steak. It’s foodie*ish… so, I dare you to put your own spin on it. And feel free to tell me all about your twist! I’d love to hear about your Foodie*ish inventions!! Preheat oven to 400 degrees. Dice potatoes in to chunky bite-sized pieces. Place diced potatoes in bread bag or gallon storage bag, and add 2 TBSP olive oil, salt and pepper to taste, paprika, and garlic powder. Toss to coat. Arrange potatoes in one layer on a baking sheet and pop them in the oven. Roast for 45 minutes, or until browned and slightly crispy. You’ll want to turn them over about half-way through roasting. Dice peppers and onions into chunky bite-sized pieces. Slice sausage at an angle into bite-sized pieces. Shred cheese. 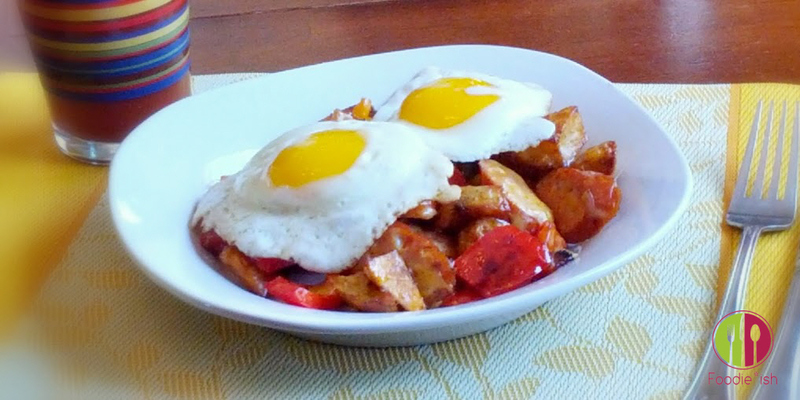 Once potatoes have been turned, set a large non-stick skillet over medium heat and add 1 TBSP olive oil. When warmed, toss in peppers and onions and saute until the begin to get softened and slightly charred. Add sausage and cook until it gets slightly browned. It should be fully cooked, so you’re just going for some caramelization. Add roasted potatoes and stir so everything is combined. At this point, you can turn the heat to low and start preparing your eggs. Make them to your liking. 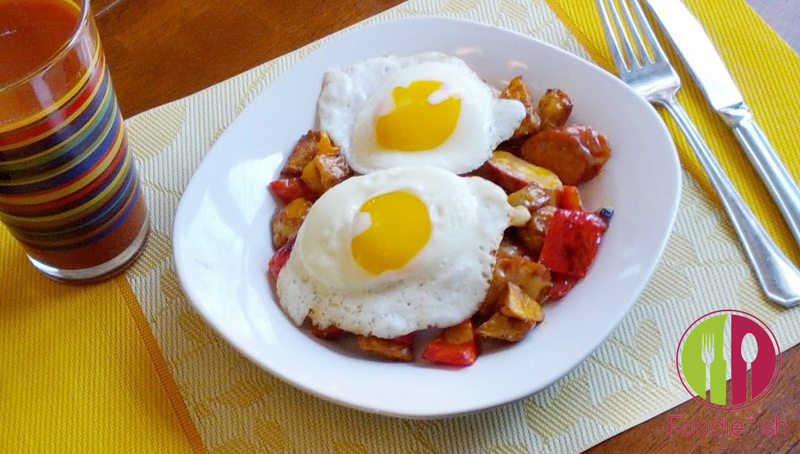 In the version of this dish, I opted for a gorgeous sunny-side up, but any egg is delicious. Two eggs per serving. Once your eggs are nearly done, turn the heat back up to medium on the potatoes and add your cheese. Combine until melted. Divide the potato and sausage mixture on to four plates, and top with eggs. I like to serve mine with a dollop of sour cream and hot sauce. Add chopped parsley for color. This is an original recipe by Glory Thorpe of Foodie*ish and was originally published on Foodieish.com. All content and photos ©2015 Foodie*ish. All Rights Reserved.